In I’ve Got This Round, readers will find the same shameless honesty and I’ll-try-anything-once spirit they loved in Hart’s New York Times bestseller You Deserve a Drink. 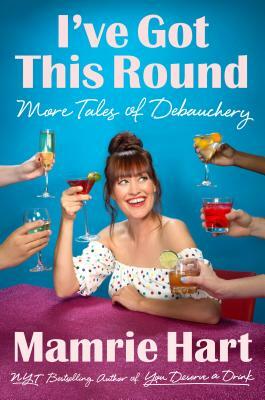 Mamrie doubles down on her strong female friendships, her willingness to engage in shenanigans, and her inimitable candor, taking the reader along for a wild and unforgettable journey through adulting. Mamrie Hart is an actress, comedian, and New York Times bestselling author who established a standout presence in the pop-culture zeitgeist with her hit YouTube channel, You Deserve a Drink. Reaching more than three million followers across her social media channels, and with more than eighty-four million views on YouTube, Mamrie’s influence as a creator earned her a coveted position on Variety’s annual list of Hollywood’s New Leaders 2016 and a spot on The Hollywood Reporter’s 2017 Digital Disrupters list. In 2016, Mamrie wrote, executive-produced, and starred-in Lionsgate’s feature-length comedy Dirty 30. Her other writing and acting credits include Camp Takota, a feature that outperformed Oscar-nominated films on iTunes’ top downloaded movies chart during the week leading up to the Academy Awards. Mamrie is from middle-of-nowhere North Carolina. She now lives in Los Angeles with her tiny hairless dog, Beanz. “You know that voice you have inside that tells you not to do certain things because they are reckless, embarrassing, or socially unacceptable? Mamrie Hart does not have that voice. She does it all and tells it all in You Deserve a Drink.”—Rachel Dratch, SNL alum and author of Girl Walks into a Bar . . .